Osho's "Death: The Greatest Fiction"
We just received a small shipment of this book from India. This classic Osho compilation was out of print for several years, so I am very pleased to have in back in our stock. This is a compilation of talks in which Osho explores the myths, fictions, and fears surrounding this inevitable event. “Life and death are one...in reality there is no such thing as death – life is eternal.” The book opens on a very personal note, Osho’s recollections of witnessing his beloved grandfather’s death when he (Osho) was only seven years old. Price: $13.95 (Californians add $1.33 sales tax); shipping $4 for the US, $8 for out of the country. I FEEL A STRONG CONNECTION BETWEEN DEATH AND MEDITATION, A FASCINATION AND A FEAR. WHEN I SIT WITH YOU, IT IS SOMEHOW SAFE TO CLOSE MY EYES AND MEDITATE; WHEN I AM ALONE, IT IS FRIGHTENING. PLEASE COMMENT. Dhyan Sagar, there is not only a strong connection between meditation and death, but they are almost the same thing – just two ways of looking at the same experience. Death separates you from your body, from your mind, from all that is not you. But it separates you against your will. You are resisting, you don't want to be separated; you are not willing, you are not in a state of let-go. Meditation also separates all that is not you from your being and reality – but the resistance is not there; that is the only difference. Instead of resistance, there is a tremendous willingness, a longing, a passionate welcome. You want it; you desire it from the very depth of your heart. The experience is the same – the separation between the false and the real – but because of your resistance in death, you become unconscious, you fall into a coma. You cling too much in death; you don't allow it to happen, you close all the doors, all the windows. Your lust for life is at the optimum. The very idea of dying frightens you from the very roots. But death is a natural phenomenon and absolutely necessary too – it has to happen. If the leaves don't become yellow and don't fall, the new leaves, the fresh and young will not come. If one goes on living in the old body, he will not be moving into a better house, fresher, newer, with more possibilities of a new beginning. Perhaps he may not take the same route as he has taken in his past life, getting in a desert. He may move into a new sky of consciousness. Each death is an end and a beginning. Don't pay too much attention to the end. It is an end to an old, rotten, miserable life style, and it is a great opportunity to begin a new life, not to commit the old mistakes. It is a beginning of an adventure. But because you cling to life and you don't want to leave it – and it has to happen by the very nature of things – you fall unconscious. Almost everyone, except those few people who have become enlightened, dies unconsciously; hence they don't know what death is, they don't know its new beginning, the new dawn. Meditation is your own exploration. You are searching to know exactly what constitutes you: what is false in you and what is real in you. It is a tremendous journey from the false to the real, from the mortal to the immortal, from darkness to light. But when you come to the point of seeing the separation from the mind and the body, and yourself just as a witness, the experience of death is the same. You are not dying... a man who has meditated will die joyfully because he knows there is no death; the death was in his clinging with life. You say," WHEN I SIT WITH YOU, IT IS SOMEHOW SAFE." There is really no difference whether you sit with me or you sit alone – it is just a mind security, the idea that the master is present so there is no harm to take the jump. If something goes wrong, somebody is there to take care of it. In meditation, nothing goes wrong – ever. Without meditation, everything is going wrong. Nothing goes right without meditation; your whole life is going wrong. You live only in hope, but your hopes are never fulfilled. Your life is a long, long tragedy. And the reason is your unawareness, your unmeditativeness. Meditation looks like death, and the experience is exactly the same. But the attitude and the approach is different, and the difference is so vast that it can be said that meditation is life and death is just a dream. But this is the function of a mystery school, where many people are meditating, where a master is present. You feel safe, you are not alone. If something goes wrong, help will be available immediately. But nothing goes wrong. So meditate while you are sitting with me, and meditate in your aloneness. Meditation is the only thing with an absolute guarantee that nothing goes wrong with it. It only reveals your existence to yourself – how can anything go wrong? And you are not doing anything; you are really stopping doing everything. You are stopping thinking, feeling, doing – a full stop to all your actions. Only consciousness remains, because that is not your action, it is you. Once you have tasted your being, all fear disappears, and life becomes a totally new dimension – no longer mundane, no longer ordinary. For the first time you see the sacredness and the divineness not only of yourself, but of all that exists. Everything becomes mysterious, and to live in this mystery is the only way to live blissfully; to live in this mystery is to live under blessings showering on you like rain. Each moment brings more and more, deeper and more profound blessings to you. Not that you deserve them, but because life gives them out of its abundance – it is burdened, it shares with whomsoever is receptive to it. There are misunderstandings piled upon misunderstandings in you. Some misunderstandings can be tremendously harmful. Getting the association of meditation and death identified in your mind is one of the greatest harms that you can do to yourself. Although you are not wrong, your associations with the meaning of death are such that they will prevent you from getting into meditation. That is one of the reasons I want to make death more and more associated with celebration rather than with mourning, more and more associated with a change, a new beginning, rather than just a full stop, an end. I want to change the association. That will clear the way for meditativeness. And if you are feeling, here with me, silent and meditative – still alive, more alive than ever – then there is no need to be afraid. Try it in different situations, and you will always find it a source of great healing, a source of great well-being, a source of great wisdom...a source of great insight into life and its mysteries. This has been another busy and fun week here at Osho Viha. We just finished proofreading the January/February 2010 issue of our Viha Connection magazine. The topic of the Special Section is "Love & Aloneness: The Relationship Koan," with very juicy articles by Anasha, Avinash, Chinmaya, Devapath, Garimo & Neerava, and Tara, all discussing the ins and outs of their relationships. Definitely not to be missed! On Saturday, the members of the editorial board came for a meeting here at Viha. It was once again time to find a topic – for the May/June issue, if you can believe it. (We have to plan much in advance!) The working title for that section is "Spreading the Fire," and we will invite some center leaders, therapists, and other folks who we feel present Osho and his message in ways that bring new people to our Master. The 52 cards in this deck together comprise a thoughtful guide to understanding the Buddha’s important contribution to human enlightenment. 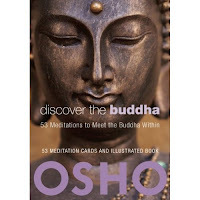 Each card contains a sutra, a commentary by Osho, and a beautiful image of a Buddha statue. Readers can first enjoy the words as poetry and allow them to evoke an intuitive, emotional response; they can then read Osho's corresponding entry in the book to create meaning. A 53rd card, called Sammasati, represents the last word spoken by the Buddha and an inspiring reminder of the reader’s own buddhahood. Individual sutras include Only Love Dispels Hate; Beyond Judgments; Neither Praise Nor Blame; Conquer Yourself; Beyond Sorrow; Awake Forever; and The Shining Way.